Hello, I’m Philip Wise and I'm the Principal Project Manager leading the Defence Infrastructure Organisation’s programme team for the new jetty & dredge infrastructure projects in Portsmouth. 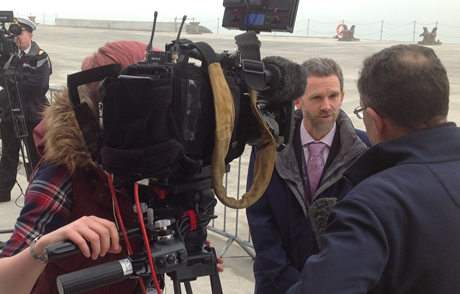 Recently we invited the media to see what had been achieved in terms of creating a home berth for the new Queen Elizabeth Class of aircraft carriers. There was a good media turn-out and lots of positive coverage. One of the most common questions we were asked was how big the new carriers are in relation to the jetty? When we pointed out that just one of the ships was almost as long as the new jetty there was often a sharp intake of breath. The size and capability of these ships is impressive. They are like small floating towns that can be deployed almost anywhere in the world. Besides the actual jetty, the project has also included a new set of harbour navigation lights (making sure the ships have safe passage in and out of Portsmouth is of paramount importance), a bespoke berthing system, a new high voltage electrical supply and of course the dredging work. This work will continue for a few more months. Once the dredge is complete we can expect HMS Queen Elizabeth to make her first visit to her new home later this year. Obviously I was keen to talk about what we had achieved in terms of the engineering, and how the various parts of the project inter-connect with the ships, but something I overheard reminded me that it’s easy to view a project like this just in terms of physical achievement. 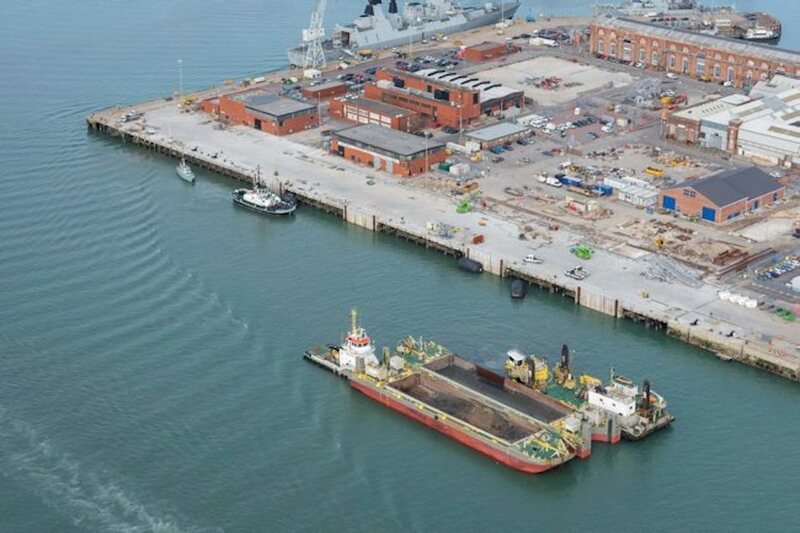 One of the journalists said something like “So this is what a hundred million pounds worth of concrete looks like…” It’s true we did use a lot of reinforced concrete given that these ships are the largest ever operated by the Royal Navy, and they need a super-sized jetty. But all this effort is really about capability. 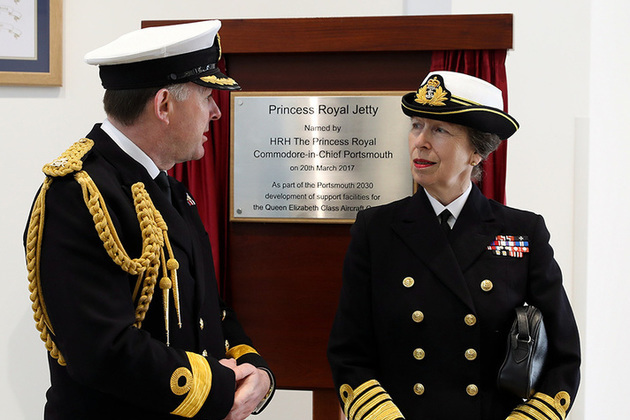 Our new carriers, HMS Queen Elizabeth and HMS Prince of Wales, the new jetty, the repair and engineering workshops, ammunition facilities and all the other new facilities are all inter-connected. They are designed to last decades, perhaps much of this century, and they will help defend our country and protect Britain’s interests around the world. Shortly after this media event I also attended the ceremony to rename Middle Slip Jetty as The Princess Royal Jetty. Obviously many docks and jetties have served warships on this site over the centuries, but in the 1920s a new concrete structure was needed for the Royal Navy’s latest aircraft carriers. Ships like HMS Indefatigable used the jetty during World War Two. 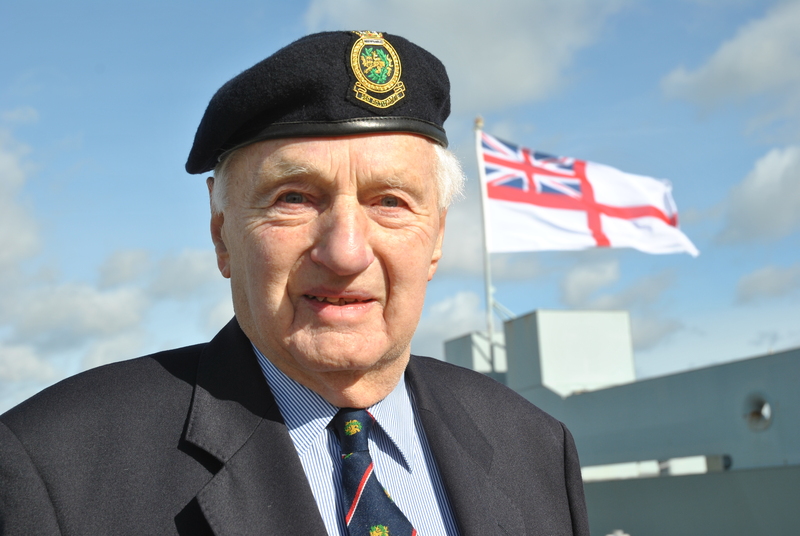 One of HMS Indefatigable’s former crew is 90 year old Les Wills. He knew the old jetty well but had not been back since 1946. We invited him to see all the work. As you might imagine he was quite surprised by what had been achieved, and how much things had changed in the seventy years since he was last there. You can watch a short film about his visit via the link below. I’ve been working on this project since 2008; others on the team go back even further. As with all major projects there have been difficulties, but part of the challenge is overcoming these issues and finding workable solutions. This we have done, through hard work, long hours and a strong team spirit. With the main work now complete I’d like to thank all those involved but especially Mike Preston, Captain Iain Greenlees, David Salmond, Sharon Richardson, Heather Walkling, Derrick Williams, Kris Cole & our contractors (Volker Stevin) team led by Gerrit Smit. The old Middle Slip jetty provided a home berth to many of the Royal Navy’s aircraft carriers for much of the last century. The work we’ve just completed means the next generation of carriers will also have a home for many decades to come.